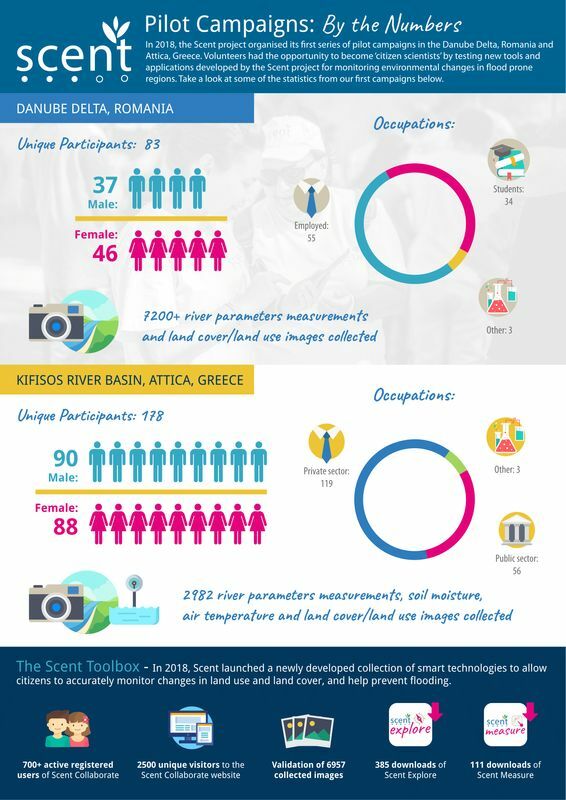 The Scent Project conducted four pilot campaigns in 2018 – two on the Danube Delta in Romania and two along the Kifisos Basin in Attica, Greece. Over 260 citizen scientists took part in the campaigns, testing the Scent environmental monitoring apps, Scent Explore and Scent Measure. More than 10,000 pieces of valuable environmental data was collected by citizen scientists during the Scent pilot campaigns concerning river parameters, water velocity, soil moisture, air temperature, and land use/land cover. Over 80 volunteers took part in the Romanian campaigns, making it one of the biggest citizen science events to ever take place in the country. The volunteers came from universities, businesses and other organisations in the local community, and for many, it was their first time to participate in a citizen science campaign. The Romanian Ornithological Society (SOR) is Romania’s largest wildlife conservation charity aiming to conserve and study wild bird species, their habitats and sites in Romania. We strive to increase people’s awareness of environmental sustainability and we work to protect biodiversity and bird fauna. Why did you decide to conduct the pilot campaigns in the Danube Delta? The Danube Delta stretches over 580,000 hectares making it the latest wetland in Europe. It is home to more than 6,000 species of flora and fauna and has the highest concentration of bird colonies in Europe. But these birds are losing a lot of habitat space in the Danube Delta because of human interventions, such as damming and draining large areas for agricultural use and intensive forestry. We believe that these changes to the landscape could create big problems overtime. But these problems can be avoided if we gather enough information to identify and stop them before they cause detrimental effects to communities, ecosystems and environmental sustainability. We also chose the Danube Delta because there is currently no up-to-date land cover/land use data available on this rural environment, to allow us to monitor these changes on a frequent basis and with high spatial resolution. Which Scent apps did you test and what did you find? The Danube Delta campaigns focused on gathering data on land use and land cover. The volunteers used the Scent Explore app and subsequently gathered lots of data – over 7,000 images to be precise. We had 8 – 10 volunteers out on the river, in a small boat from 10am until 5pm, travelling around the river, playing the game and taking lots of pictures. The first campaign took place in August. The second one was at the end of September. We were surprised to see how much the water levels had changed in just a few weeks. Within a month the water levels had decreased dramatically. There were some areas where we went in the boat in August, that we couldn’t go to by boat in September, as the water was too shallow. What impact would that have on the environment? Fish cannot live in such shallow water. This is then a problem for fishermen and then for the birds too. This is why citizen science and the Scent Apps are so important. I think it is important for citizens to know and be aware of what is going on in their environment because ultimately, they are the people who will be most impacted by any changes. But it is also beneficial for policy makers, local authorities and other interested organisations to use this data. 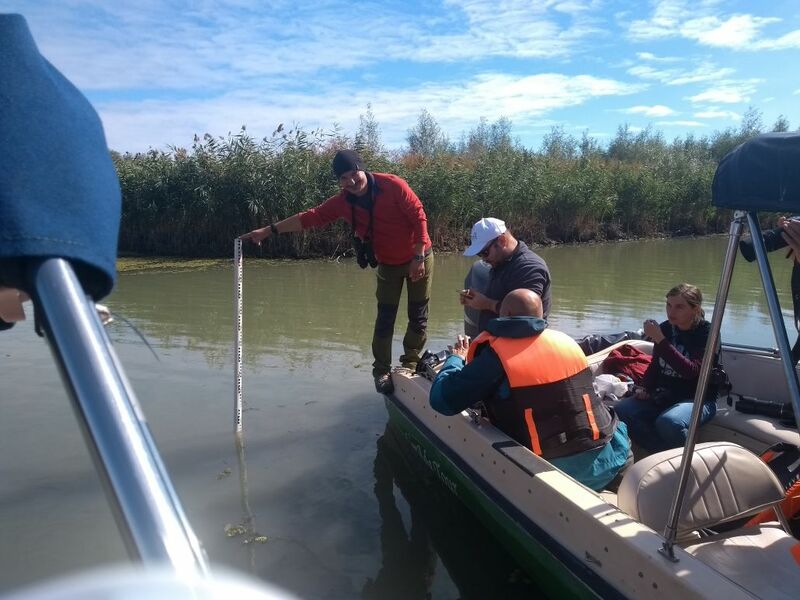 Many areas we analysed along the Danube Delta are not available on any flood risk maps, so these technologies are very useful.